She's spent the past twenty-seven years as a freelance writer and journalist. She started her career as a newspaper and magazine features Jacqueline L. Landry was born in Houston, Texas and grew up along the Texas-Louisiana Gulf Coast. She showed a talent from a young age for writing, drawing and music. Early literary influences included Frank Herbert, Colleen McCullough, Jack Kerouac, and Robert Heinlein. She's spent the past twenty-seven years as a freelance writer and journalist. She started her career as a newspaper and magazine features reporter, specializing in the arts and entertainment. She also worked as a foreign correspondent for Reuters Wire Service while living on Guam, covering the arts and politics. To ask Jacqueline L. Landry questions, please sign up. Jacqueline L. Landry Jane Eyre and Rochester, simply because the story arc speaks to change and redemption. Jacqueline L. Landry I listen to audio books of fellow authors in my genre, keep a dream journal, and talk to friends about my writing. Over the River, Through the Woods:Now available in paperback via Amazon.comas well as for purchase at your local bookstores. Ask for it at your favorite booksellers! Life is made up not of days, but of moments. What if, in one moment, everything you knew about your life changed forever? We’d love your help. Let us know what’s wrong with this preview of Blackbirds in the Pomegranate Tree by Mary Ellen Sanger. We’d love your help. Let us know what’s wrong with this preview of The Unitarian Universalist Pocket Guide by Peter Morales. We’d love your help. Let us know what’s wrong with this preview of The Bengal Tigress by Abhijit Naskar. We’d love your help. Let us know what’s wrong with this preview of THE Pegan Cookbook by E. L. Frank. On January 23, 2015, my romantic suspense novel, OVER THE RIVER, THROUGH THE WOODS was published. My 6th novel, but the first to be published. I'm rather proud of it, as y'all can imagine. "Life is made up not of days, but of moments. What if, in one moment, everything you knew about your life changed forever? Jennifer and David Brookehouse have an ecstatically happy marriage and thriving careers. She, a noted photographer, and he, an anesthesiologist with University of Washington Medical Center in Seattle. She performs in musical theater and he competes in bicycle races for charity. Jenny could never have foreseen how her life would change when she sent her husband off to a race in Vermont. In a moment, his body and mind are shattered by a drunk driver. He nearly dies and spends weeks in a coma. When he awakes, he is a changed man. Just when things seem to be getting back to normal, David disappears without a trace. Jenny must swim a sea of red tape just to get the police involved in a search with no clues and no witnesses. When no one believes he can be found and brought home alive, Jenny has faith and refuses to give up. As her life begins to fly out of control, Jenny meets her childhood crush, British actor, Karsen Langford, at the musical theater where she volunteers. Their growing friendship will cause tongues to wag, and the press to link them romantically. Though innocent of any wrong-doing, Jenny will face judgment and scorn, all while desperately searching for the husband she loves." I've had several readers, but no one has written a review, which is problematic. 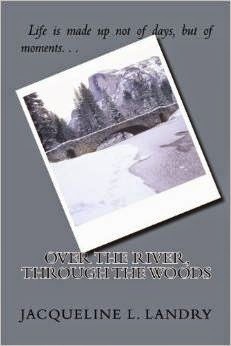 Won't you consider writing a review for OVER THE RIVER, THROUGH THE WOODS? I'd certainly be willing to return the favor as I'm an avid reader, particularly of the mystery/suspense genre.